The South Korean government has said it is concerned about the US's move to overrule a sales ban of some older Apple iPhone and iPad models. 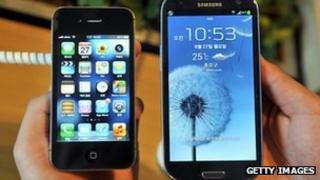 In June, the US International Trade Commission (ITC) ruled that Apple infringed a patent of rival Samsung. President Barack Obama's trade representative then vetoed the decision because of its "effect on competitive conditions in the US economy". South Korea said the move would affect the protection of patent rights. It was the first time since 1987 that a presidential administration had vetoed an ITC import ban. The ban was set to take effect on 5 August. The South Korean media denounced the US move as being "protectionism". And the South Korean trade ministry said in a statement: "We express concerns about the negative impact that such a decision would have on the protection of patent rights." It also called on the ITC and the Obama administration to make "fair and reasonable decisions". Samsung now faces a decision on Friday to decide whether some of its phones and tablets infringed on Apple's patents and should be banned from imports into the US. Apple and Samsung, the top two global smartphone makers, have been locked in a global patent war since 2011. The now-overturned patent related to 3G wireless technology and the ability to transmit multiple services correctly and at the same time. The ITC ordered a halt on all imports and sales on AT&T-sold models of the iPhone 4, iPhone 3, iPhone 3GS as well as the iPad 3G and iPad 2 3G. Some of those devices are no longer on sale in the US.